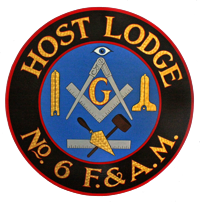 Host Lodge History – Host Lodge #6 F. & A.M. Host Lodge is actually a Consolidation of three lodges (est. 1990). Before we get to the facts leading up to the consolidation and formation of Host Lodge #6, we have a brief history on the three lodges that preceded it. Lebanon Lodge #6: meeting in Glen Gardner. Originally #54, was warranted on 11/14/1826 and renumbered #6 on 11/08/1842. That warrant was surrendered in 1859 and a new one issued on 1/19/1871. Worshipful Master in 1989 was WB Kenneth A. Moore. Stewart Lodge #34: meeting in High Bridge at Hobart Masonic Temple and was warranted 1/10/1855. Worshipful Master in 1989 was WB Charles T. Housel. Hobart Lodge #175: meeting in High Bridge at Hobart Masonic Temple and was warranted 1/24/1901. Worshipful Master in 1989 was WB Peter Lanka. Deliberations about consolidating the lodges began on January 1, 1989 when the Worshipful Masters of Lebanon and Stewart Lodges met to discuss their options. A month later on March 5th, the Woshipful Master of Stewart approached Hobart Lodge to advise them of ongoing plans to consolidate with Lebanon and to see if Hobart would join. On May 2, 1989 the first meeting was held by the Consolidation Committee. The members of the committee were each chosen by the Worshipful Masters to represent their lodge. The name Host Lodge #6 was suggested by RW Paul C. Hankinson, PGC. It represented Ho from Hobart, St from Stewart and #6 from Lebanon. The name of the building was to remain Hobart Masonic Center since it was named for Garret Augustus Hobart, a NJ Mason and a Vice President of the United States. This was unanimously approved by the committee members. In September 1989, the Worshipful Masters of the three ledges were informed of the Committee’s recommendation and a “summons” was mailed to members of the lodges involved. On 11/15/1989, Lebanon Lodge voted 22-0 in favor of the consolidation; 11/16/1989, Hobart Lodge voted 24-1 in favor of the consolidation; 11/17/1989, Stewart lodge voted 22-0 in favor of the consolidation. The First Communication and the Installation of Officers for Host Lodge #6 was held at Hobart Masonic Center in High Bridge, New Jersey on January 3, 1990.